A pure monopoly is defined as a single seller of a product, i.e. 100% of market share. In the UK a firm is said to have monopoly power if it has more than 25% of the market share. For example, Tesco @30% market share or Google 90% of search engine traffic. A monopoly maximises profits where MR=MC (at point m). It sets a price of Pm and quantity Qm. Productive inefficiency A monopoly is productively inefficient because the output does not occur at the lowest point on the AC curve. X – Inefficiency. – It is argued that a monopoly has less incentive to cut costs because it doesn’t face competition from other firms.Therefore the AC curve is higher than it should be. Supernormal Profit. 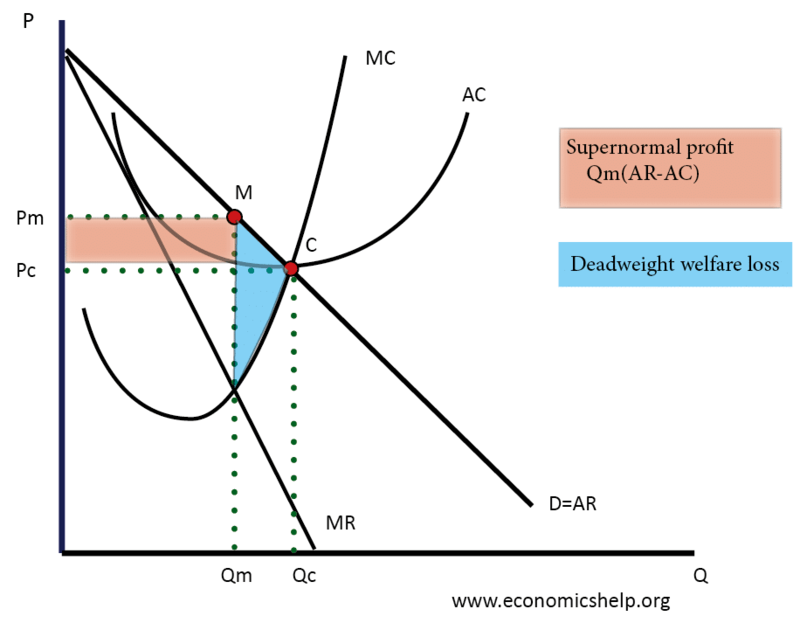 A monopolist makes Supernormal Profit Qm * (AR – AC ) leading to an unequal distribution of income in society. Higher prices to suppliers – A monopoly may use its market power (monopsony power) and pay lower prices to its suppliers. E.g. supermarkets have been criticised for paying low prices to farmers. This is because farmers have little alternative but to supply supermarkets who have dominant buying power. Diseconomies of scale – It is possible that if a monopoly gets too big it may experience dis-economies of scale. – higher average costs because it gets too big and difficult to coordinate. Lack of incentives. A monopoly faces a lack of competition, and therefore, it may have less incentive to work at product innovation and develop better products. 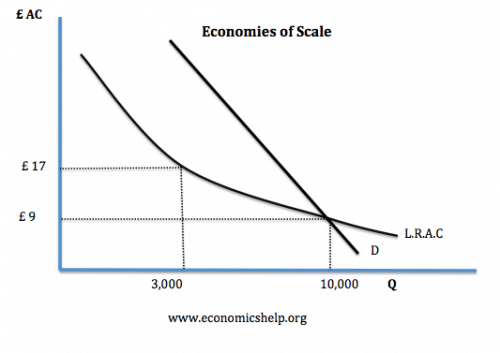 If there are significant economies of scale, a monopoly can benefit from lower average costs. This can lead to lower prices for consumers. In the above example If there were 3 firms producing 3,000 units at an average cost of £17, average costs would be higher than a monopoly producing 10,000 units, and an average cost of £9. Therefore, for natural monopolies and industries with significant economies of scale, monopolies can be more efficient. Monopolies make supernormal profit which can be invested in Research & Development. This is important for industries like medical drugs which require a lot of risky investment. In many industries which require substantial investment – a competitive industry with many small firms would be unsuitable. Google gained monopoly power through offering innovative new products. It is hard to argue Google has x-inefficiency because of its monopoly power. You could make a similar case for firms, such as Apple and Amazon. In this case, it is their market dominance which comes from being innovative and meeting a consumer demand. A domestic monopoly may face competition from abroad, and therefore what may appear as a monopoly may still face competitive pressures. Also, a monopoly may face competition from related industries, e.g. Eurotunnel has a monopoly on train services from London to Paris, but faces competition from airlines. It depends on the industry in question. For example, a monopoly is needed in a natural monopoly like tap water. However, for restaurants, there are no significant economies of scale and it is important to have a choice. Therefore monopoly would be very inappropriate for restaurants. Some industries need a lot of research and development (e.g. building new aeroplanes, research drugs). Therefore, a monopoly may be needed in this industry. A government may be able to regulate monopolies to gain benefits of economies of scale, without the disadvantages of higher prices. Vertical Integration. Where a firm gains market power by controlling different stages of the production process. A good example is the oil industry, where the leading firms produce, refine and sell oil. Legal Monopoly. E.g. Royal Mail or Patents for producing a drug. Internal Expansion of a firm. Firms can increase market share by increasing their sales and possibly benefiting from economies of scale. For example, Google became a monopoly through dominating the search engine market. Being the first firm e.g. Microsoft has created monopoly power by being the first firm. Windfall tax on monopoly profit. Investigating abuse of monopoly power, e.g. collusion. Natural monopoly – when the most efficient number of firms in an industry is one.